Among mouthwatering sweets, the jelly candies industry is thriving. The surging popularity has led to diverse forms of the chewy sweets, delighting Korean consumers not only with their taste but also low calories. “In this harsh world, soft jelly candies are a streak of light in my life,” said Hwangbo Kyung-sun, an office worker in Seoul. Soft and chewy jelly products that were once perceived as treats for young children have now become one of the most favored types of sweets among adults. The popularity of gummies can also be spotted on social media platforms. On Instagram, more than 382,000 posts had the hashtag #Jelly in Korean, while the Facebook page “Group of Jellychungs” -- jelly lovers -- had over 28,000 followers. As for ever-evolving “meokbang” clips or eating videos on YouTube, those featuring gummies are also favorites among viewers. One of the reasons behind the popularity of gummy sweets is their chewy texture. “Candies are too hard and their sweetness can get cloying. Chocolates are sticky, and too sweet for me. As for jellies, you just cannot stop chewing them,” Hwangbo said. As for Lee Min-jin, an office worker in Seoul, gummy sweets’ texture relieves stress after a hard day at work. “That moment when your teeth slides into a gummy bear, and how the sweet flavor floods your mouth -- the tension you were feeling in your head and around your shoulders just goes away,” Lee, 29, explained. Lee’s experience is backed by research. According to a study by the Dental College of Dankook University, chewing activates brain functions that lower the level of cortisol, the stress hormone. The experiment was conducted by analyzing the brainwaves of 36 adults, who had to chew gum for an hour every day for four weeks. The favored chewy texture has also led to the rise of konjac jellies among people who wish to have desserts but are concerned about high calories or their health. “I love the soft and chewy texture. Konjac jelly products have become my favorite desserts because they almost carry no calories at all,” said Do Eun-young, 32. 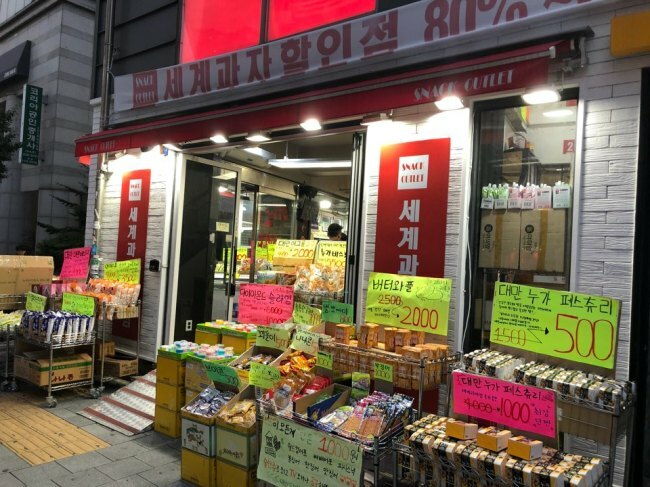 The popularity of jelly products began to grow in Korea when stores that specialize in imported snacks and candies started to pop up in 2014. For entrepreneurs, it was an “affordable” business model that requires a small space. As for Korean consumers, the shops provided easier access to new and different products of the world. As gummy sweets were not the mainstay of Korean confectionery companies at the time, the products from Haribo, a world famous German confectionery company, and the like fascinated Korean consumers with their jelly candies. The jelly candies industry has seen tremendous growth in the past four years. 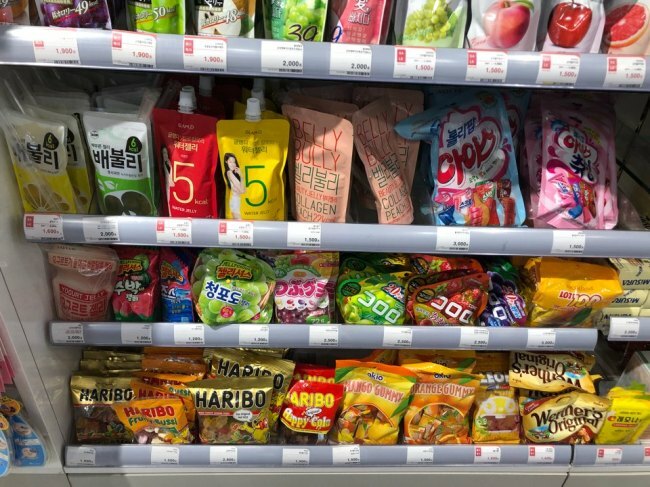 According to Nielsen Korea, the domestic value of the gummy sweets market reached 184 billion won ($164 million) as of last year, almost triple its size of 69 billion won in 2014. To meet soaring demand, Korean confectionery manufacturers are scrambling to introduce new gummy products. What appears to be trending for Korean products are jelly candies that feature the flavors of other steady-seller snacks. Lotte Confectionary’s Yoghurt Jelly inspired by the familiar taste of the probiotic dairy product Yakult has been a hit since it first came out in 2016. More than a million packs of the Yoghurt Jelly were sold within 50 days after its release. The company also rolled out Kokkalcorn Jelly, which is inspired by salty corn chips, and gummies -- Jaws Bar Jelly, Watermelon Jelly and Screwbar Jelly -- that taste like its ice-cream products. Orion Confectionery has been a front-runner in the gummy industry here. Although less attention was paid to jelly candies in the 1990s, the company released Migummi, purple grape flavored gummies, in 1992. The product is still a steady-seller. As Migummi was a hit when it was first introduced, the company made two other flavors, orange and apple, which were available for a limited period in the 1990s. Amid recent demand for gummies, the company has released more flavors. In November, it introduced the peach flavor. Orange and green grape flavors followed in March and April respectively. “Jelly candies have gained popularity among women in their 20s and 30s as desserts,” an official from Orion said.